Future Perfumers – What does it mean to be a perfumer? IFF ISIPCA students in the Master of Science Scent Design and Creation program were asked to respond to this question during our recent video shoot. Watch the video see what else they shared with us. Ashley: To me, a perfumer is the person creating fragrances so I feel like it's very much putting you into the fragrance your likes, your dislikes, what moves you - kind of putting your scent memories in a bottle. George: I know I just love smells. So it being a perfumer means that I get to experience life in a way which not a lot of people get to experience. Emmanuelle: For me being a perfumer is making a sentence with pictures, a person, a life situation that can translate exactly in the in the soul of something …as a smell. Athena: For me, being a perfumer is like you're doing a magic show because it allows you to create a story, use your imagination or inspiration to trigger other people's emotions and to build a dream. Renan: I really dream about moving the world in some way and I think that creating perfumes would be just that – and that would make me feel very happy. What do you think it would mean to be a perfumer? We love to hear your thoughts #futureperfumer – tell us on LinkedIn, Twitter, Facebook, Instagram. Start here for a career in fragrance – apply now for the 2018 Master of Science Program in Scent Design and Creation. Students at the IFF ISIPCA Master of Science in Scent Design and Creation had an intriguing summer assignment – to find an internship where they could gain deeper insights into what influences fragrance purchase decisions. The students found themselves in a range of different situations but everyone felt that they gained important knowledge that would serve them well in their future careers as scent design manager and perfumers. Earlier this fall, they presented their findings to their fellow classmates as well as to new students just starting the program. Sofia shared that ‘a perfume whispers a story that speaks to the human soul and heart’. She noted that fragrance shoppers are very curious to learn more about the fragrances they are considering. 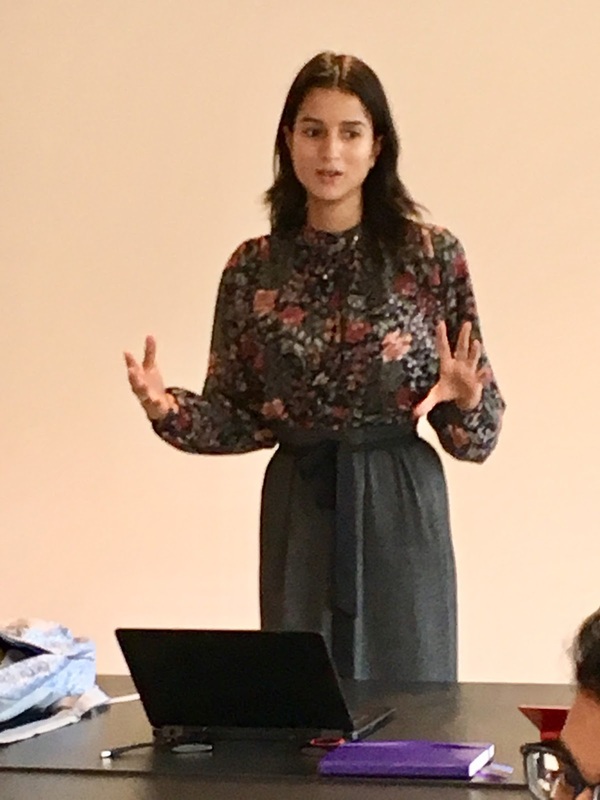 Sofia’s research included interviews in which she asked a range of shoppers questions about what brought them into the store and to the fragrance area. She found that many shoppers were favorably moved to purchase by scents with significant ‘sillage’ – a romantic and uniquely French word that describes the degree to which a perfume's fragrance lingers in the air when worn. Jihee’s learning included situations where ‘shoppers met their own scent. To her, this meant that these shoppers came to purchase with certain ideas in mind, often gained from reading fragrance blogs, but then they moved on - often to something similar but different, that individualized their preconception. Kira worked in China, where she noted that those who bought fragrance were often inspired by online presentations of fragrances that were much stronger than they would have bought in store. Many buyers described their ideal fragrances as light, clean, gentle, elegant but were intrigued social media posts as well as celebrity endorsements to try, and then buy, more complex ‘heavier’ scents. Several of the students interned in the concept store at the Grand Musée du Parfum in Paris, where they learned to create links between museum visitors’ newly expanded awareness of fragrance history and olfactive and their personal product preferences. One student drew on his knowledge of fragrance geneology to help a museum visitor find the perfect fragrance gift for her husband, based on a memory she had of a classic fragrance no longer in existence. Her purchase was in the same olfactive family and creative spirit, but with a modern interpretation. Junnan worked in different locations for the same brand – noting in particular the differences of connecting with a perspective buyers in the intimacy of a small boutique – a sharp contrast to the busy environment of department store. He noted that establishing a relationship, listening, analyzing, and presenting a particular fragrance finding a resonance with the language of a perfumer made all the difference. Everyone agreed that those who are interested in purchasing fragrances today are more and more sophisticated, and yet, very hungry to learn more. The stories behind the creative process, the combination of the materials, the history and approach of perfumers – all add to the richness of the experience, that in the best situations, are mutually satisfying for both those who purchase as well as the retail associates. Have you purchased a fragrance recently where this was true for you – leaving with a smile as well as a new scent? We love to hear your thoughts on being a #futureperfumer – tell us on LinkedIn, Twitter, Facebook, Instagram. Start here for a career in fragrance – find out more about applications for the 2018 Master of Science Program in Scent Design and Creation. “2017 was another notable year in terms of progress, both strategically and in regards to our financial performance,” said Chairman and CEO Andreas Fibig. A copy of the Company’s Annual Report on Form 10-K will be available on its website at www.iff.com or at sec.gov by February 27, 2018. A live webcast to discuss the Company’s fourth quarter and full year 2017 financial results will be held on February 15, 2018, at 10:00 a.m. ET. at ir.iff.com.